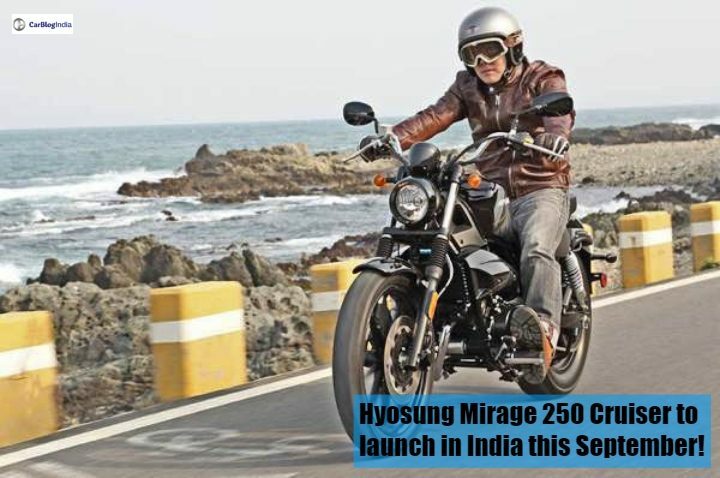 Latest scoop reveals that Hyosung Mirage 250 Cruiser is going to launch later this month. The 250cc cruiser will replace the now-defunct Hyosung Aquila. It recently ended its collaboration with DSK Motowheels and now is launching the bike with Kinetic group owned Motoroyale. Recently, Hyosung had broken all its ties with DSK Motowheels. Together, they used to sell bikes in the Indian market. After financial problems with DSK, Hyosung had to shut down its Indian operations. Now, it was recently relaunched by the Kinetic Group owned Motoroyal brand. Under this new portfolio, the DSK-Motoroyale will launch the Hyosung Mirage 250 cruiser in India. Now the latest scoop says that this 250cc cruiser will launch later this month. It comes in as a replacement for the now-defunct Hyosung Aquila 250 cruiser. Unlike the Classic Retro looking Aquila, the Mirage will come with a more urban street design. The Aquila 250 retailed for around Rs 2.75 Lakhs so the Mirage 250 might be priced around Rs 3 Lakhs. Also Read: Benelli Imperiale 400 India Launch Confirmed For 2019- What To Expect? For engine purposes, the Hyosung Mirage 250 gets a Euro 4 compliant version of the liquid-cooled 250cc V-Twin engine. This engine churns out 25.8 BHP of maximum power and 21.7 Nm of maximum torque. It produces around 0.7 BHP less and 0.7 Nm less than the Aquila. The engine comes mated to a 6-speed Manual transmission, which was a 5-speed unit on the Aquila. The Hyosung Mirage 250 comes with a 15-litre fuel tank, which is a litre more than the Aquila. The estimated mileage of the bike is going to be around 27 KMPL, as Hyosung claims of a 400 km total riding range. For a 250cc V-Twin engine bike, a mileage figure of around 27 kmpl is well enough. For braking, it will use front and rear disc brakes with dual-channel ABS as standard fitment. In the front, Hyosung Mirage gets a telescopic suspension and in the rear, it gets twin-shock absorbers. Also, when compared to the Aquila, the Mirage 250 sports a bigger tire set. The Mirage comes with a 19-inch wheel in the front and a 16-inch wheel in the back. The Hyosung Mirage 250 gets a sharper urban design language with the tear-drop shaped fuel tank, blacked out alloy wheels and the hefty rear mudguard. It gets the ‘cow-horn’ handlebars which give the cruiser more sporty look. Features onboard include a single-pod instrument console, iconic round headlights, LED position lamps and LED tail lights. Currently, The Mirage 250 has no competition as such. Earlier also, the Aquila was alone in that price range. However, a lot of other bikes have come up in that price range. These bikes include BMW G310 twins, Ninja 300, Benelli TNT 300 and more such bikes. If the bike is going to cost around Rs 3 Lakhs, then it will compete with these bikes.